If you are wondering about the most beautiful places in Switzerland you will find your answer here. 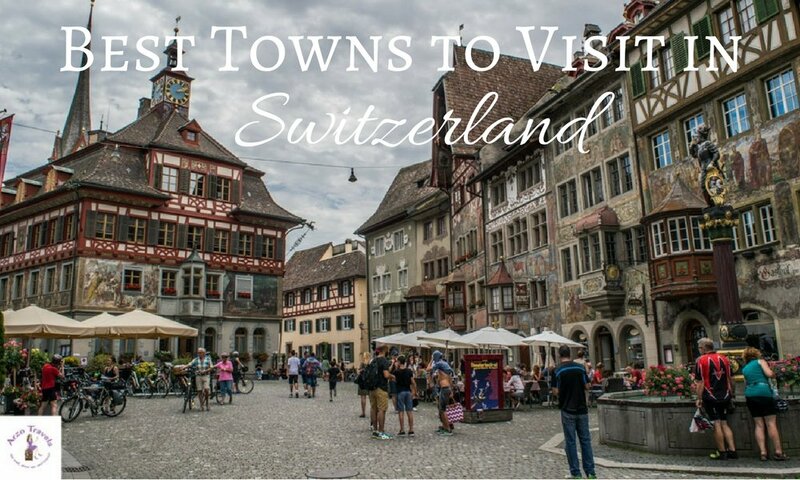 I have compiled a list of my favorite towns and villages in Switzerland – so if you are looking for travel inspiration and Switzerland destinations to visit you will surely be inspired after finding about about the cutest villages and towns in Switzerland. P.S. Even if you are not a budget travel, read my budget travel tips for Switzerland – after all, Switzerland is extremely pricey and saving money won’t do you any harm :). 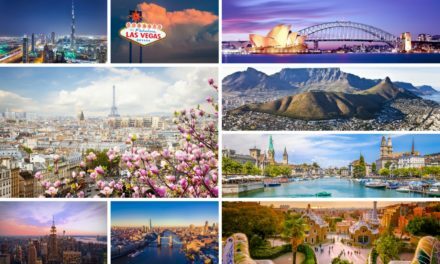 Most people think of breathtaking scenery when they first think of Switzerland and while it is true that Switzerland’s scenery is one of a kind, it is also true that Switzerland is home to many cute, fairy-tale towns and villages as well, so if taking about the best places to visit in Switzerland these towns are the best to visit. While I can understand the urge to spend as much time as possible in nature, I also recommend exploring the many cute towns and finding out more about the other side of Switzerland. So, when you are in Switzerland you should definitely make sure you see the most beautiful towns in Switzerland and add them to your Switzerland itinerary. 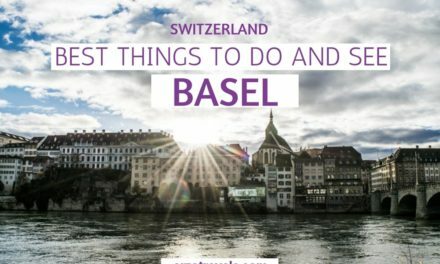 Since my post about the 25 best things to do in Switzerland has become quite popular (if I may say so myself) I have decided to give you some more information on beautiful places to visit in Switzerland. 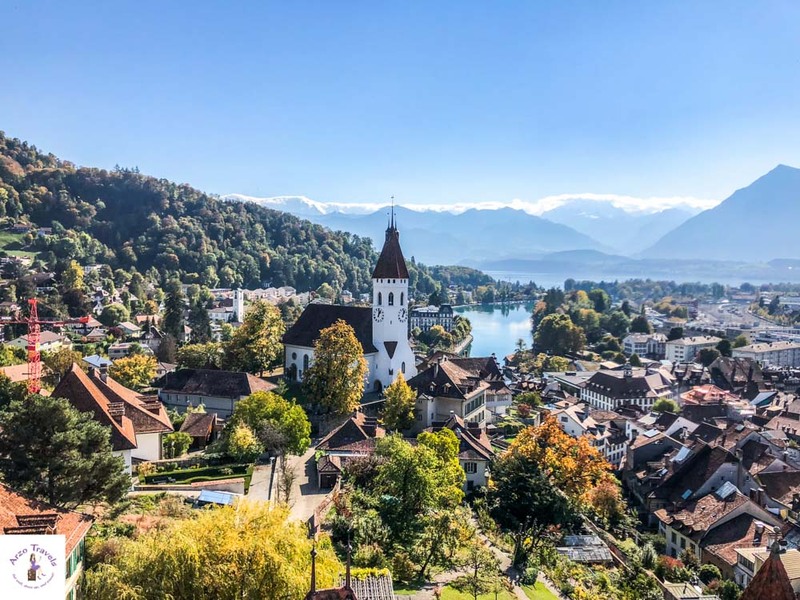 While it is hard to talk about “the best towns in Switzerland”, as each has its own charm and attracts different kind of visitor, I am confident to say these are the best towns to visit in Switzerland. Here are my top Swiss towns and I hope this list inspires you to visit some of the best places in Switzerland. Here are my favorite picks! I visited Stein am Rhein for the first time recently and I am must say it felt unreal! Stein am Rhein is so exquisitely pretty I couldn’t believe I waited so long and didn’t visit until my eighth or ninth Switzerland trip to finally pay a visit. It is one of the places to visit in Switzerland, don’t miss out or you might end up regretting it. The town is pretty small so walking around doesn’t take long. Despite its small size it is stuffed with gorgeous houses which have unbelievable and fascinating architecture. The facades are really interesting and you do not have to search for long to find them, however, even if you do take your time, the town will not take more than a few hours. 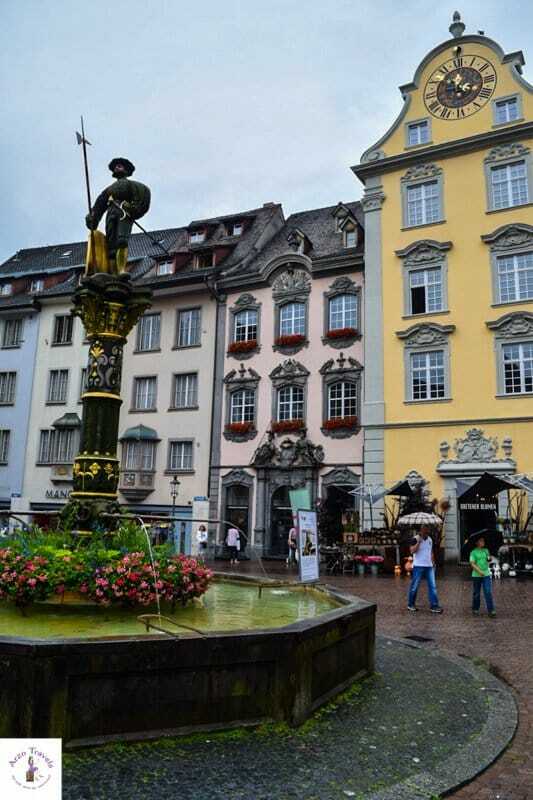 After strolling in the town centre you could spend some time walking along the Rhein river or even do a boat tour. Or you can check out Hohenklingen Castle or the many vineyards in the area. 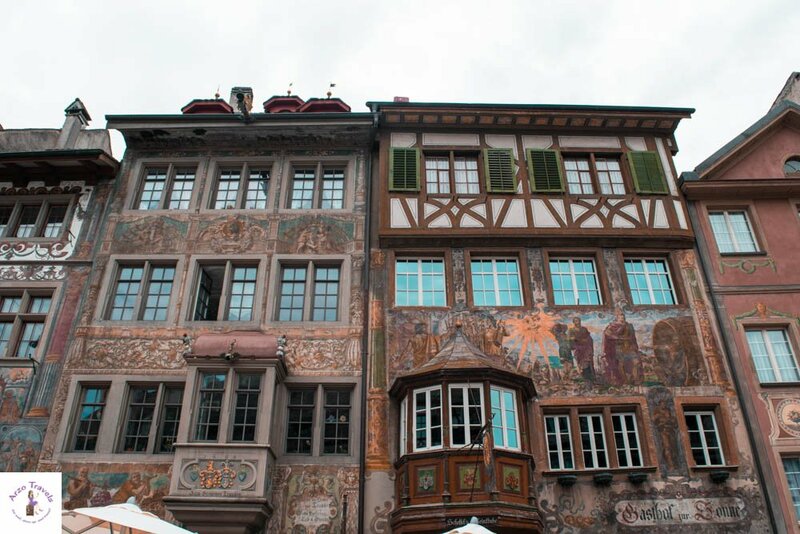 I visited Stein am Rhein as a day trip from Zurich and did not stay overnight in the town. The hotels I have checked out for you have good ratings. Most people skip the town centre of Schaffhausen and instead visit the Rhein Falls only- after all, they are the biggest waterfalls in Europe! However, if you ask me this is a mistake. Though the Rhein Falls are very close to the town of Schaffhausen (in a smaller town called Neuhausen am Rheinfall), it is worth taking a little detour and spending a few hours in lovely Schaffhausen as well. 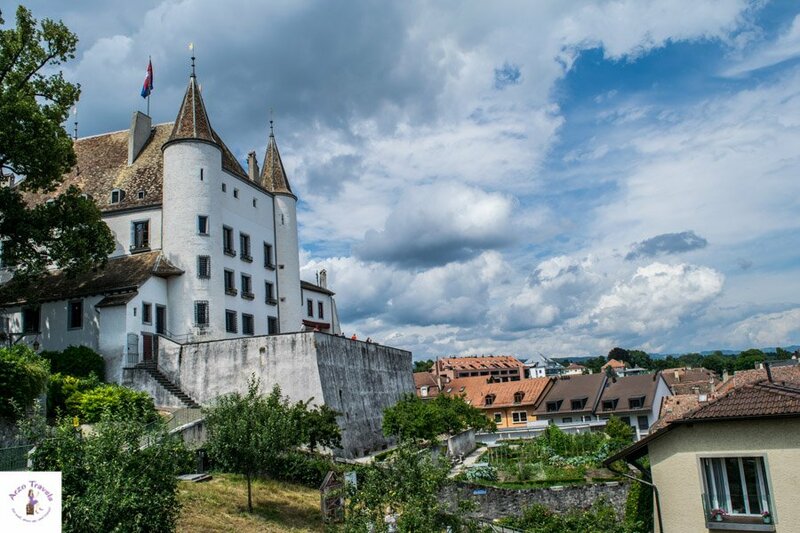 I would recommend visiting Munot, a hilltop fortress and tower where you can find great views of the Rhein river and some vineyards as well as Schaffhausen. I recommend strolling along the water and strolling through the town center as it is extremely vibrant – actually one of the most colorful I have seen in Europe – and has beautiful facades and interesting little stores. Visiting the Rhine Falls is another fun thing to do in Switzerland. I stayed at Hotel Rüden – a very authentic Swiss hotel in the old town and can recommend it though it is quite basic but the location was good. Click here to find out more about the hotel. Regular readers might have thought that Interlaken would be at the top of my list for the cutest towns in Switzerland but when it comes down to it, I actually prefer Thun over Interlaken because it really is one of the most beautiful towns in Switzerland. 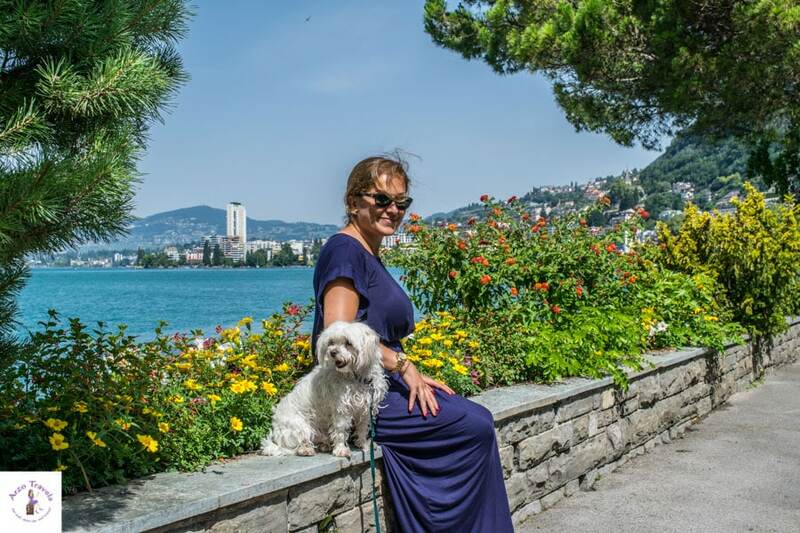 The walk along Lake Thun is lovely, especially if you walk towards Schloss Schadau – Schluss Schadau is a beauty and since there is some greenery there it is also a great place to relax. Behind the is Lake Thun, one of my favorite lakes in Switzerland where you have great views of the Swiss skyline (which consists of the stunning mountains Mönch, Eiger, and Jungfrau). It is one of the nicest walks you can have because you are right by the water most of the time and it is just so gorgeous. If you ask me, you should skip the bus and just walk! I stayed in Interlaken and some other places, but not directly in Thun. 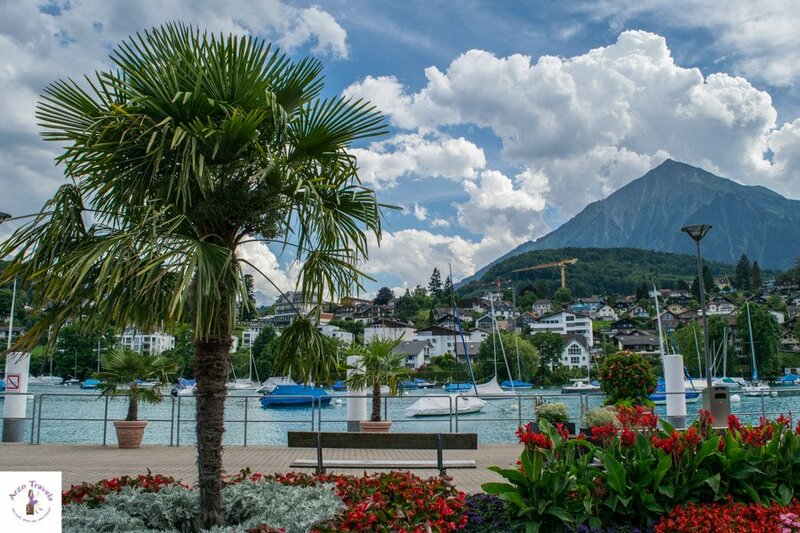 For the region of Interlaken I recommend the fantastic 4* Hotel Grand Giessbach. Click here to find out more about this great hotel (that unfortunately is closed in the winter). Interlaken, which means ‘in between the lakes’ is in the midst of two lakes – Lake Thun, Lake Brienz. It is one of the most popular tourist spots in Interlaken and, quoting from hear-say, it is one of the very few places that will never have to worry about a lack of tourists as people just keep visiting despite the extreme prices there. My favorite thing about Interlaken is its great location for surrounding attractions, having two train stations, it really opens up your options for a whole range of excursions. For skiers, Interlaken has easy rail access to the world-renowned resorts and there’s lots more to keep adrenaline junkies satisfied here with options of zorbing, bungee jumping and sky diving all available through the Alpin Center. They also offer lots of hiking/biking treks and trails for those wanting to enjoy the clear mountain air without the adrenaline. If you have any energy left after that, Interlaken is a great spot to set off for the glacier hike at the top of Jungfrau, though it’s not for the faint of heart! 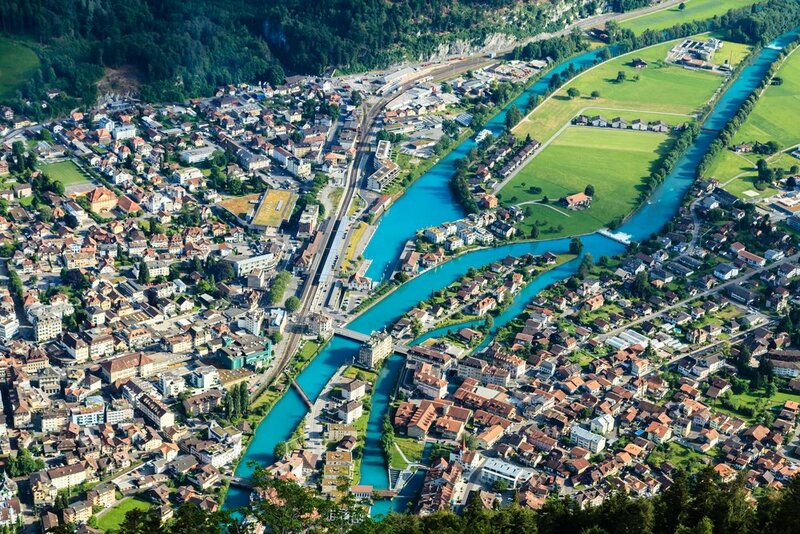 If you ask me, Interlaken is one the best places to visit in Switzerland! I stayed at several hotels in Interlaken and while the prices for accommodation is shockingly high, I loved my stay at Grandhotel Giessbach (click here to find out more about this hotel) and Hotel Interlaken. If you are looking for colorful places you have found the right place in Appenzell. The capital of the canton Appenzell Innerrhoden is especially small but seriously cute with many colorful, one of a kind houses. It is not one of the hotspots (yet) and shops are not open for long during the day but it makes a great day trip from Zürich, especially if you also visit one of the mountains close by such as Ebenalp Mountain. In addition, if you are looking for a chocolate box town that isn’t yet stuffed with tourists this could be one of the best places to stay in Switzerland. As mentioned, the town centre is very petite so whilst you can get lost in the town centre for a short while only, you should also visit some of the mountains in the region, including Ebenalp Mountain. 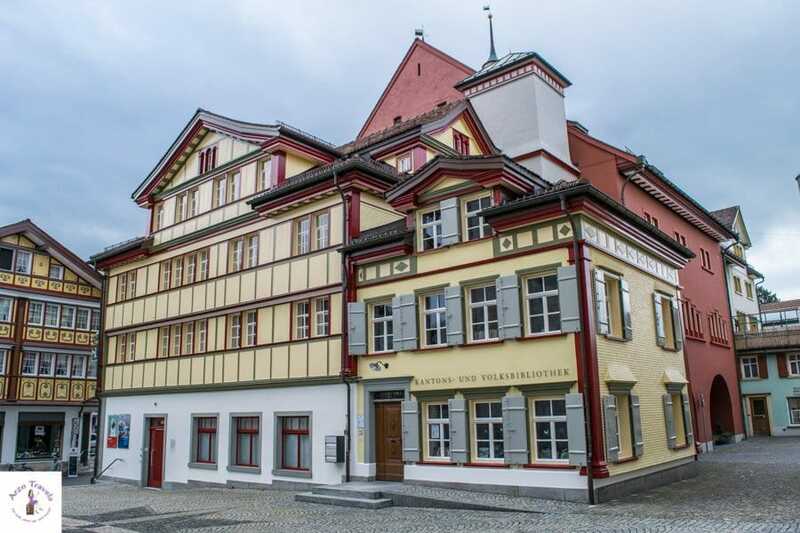 I stayed one night in a lovely, but very simple guest house in Appenzell -Appenzell´s hotels are generally more basic, but I was still happy with my accommodation and you can check out the hotel by clicking here. 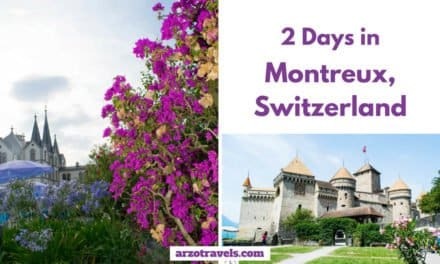 The reason Montreux has made it onto my top ten list is easy: Montreux is just stunning and owes its beauty to the fact that it mostly consists of flowers and Lake Geneva. 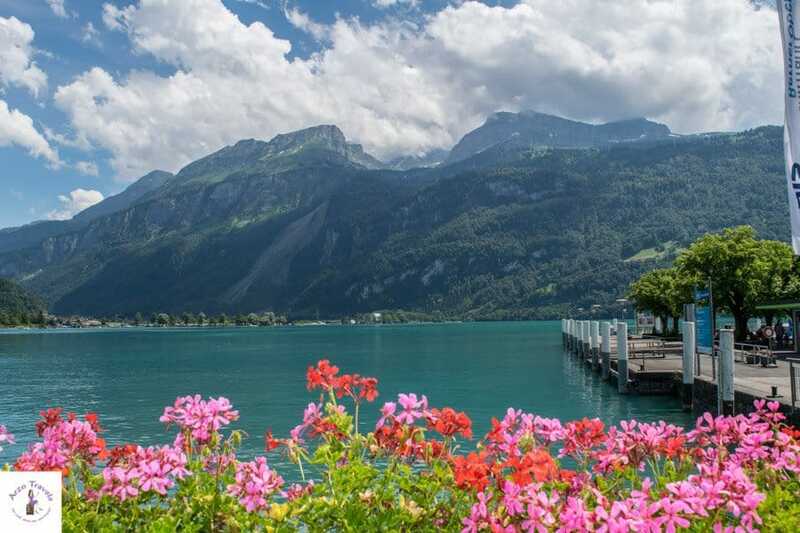 It may sound like an exaggeration but when you visit you really cannot help but be amazed by the generous display of flowers you see lined up by the lake which make it one of the most beautiful places in Switzerland. I don’t think I need mention the clear, beautiful water of Lake Geneva that is so inviting to hop in and take a swim if you are feeling brave. If this is the case, there are many easily accessible spots to take the plunge. So without question, it is one of the places to see in Switzerland. In Montreux you can take boat tours out onto Lake Geneva. From here you should be able to see Chateau de Chillon, a magnificent castle perched on a rocky base a few meters from the lake’s coast. If vineyards are more your thing, just go towards Chexbres to see the terraced vineyards of the Lavaux UNESCO World Heritage Site where you can stroll through the vineyards and even do some wine-tasting. 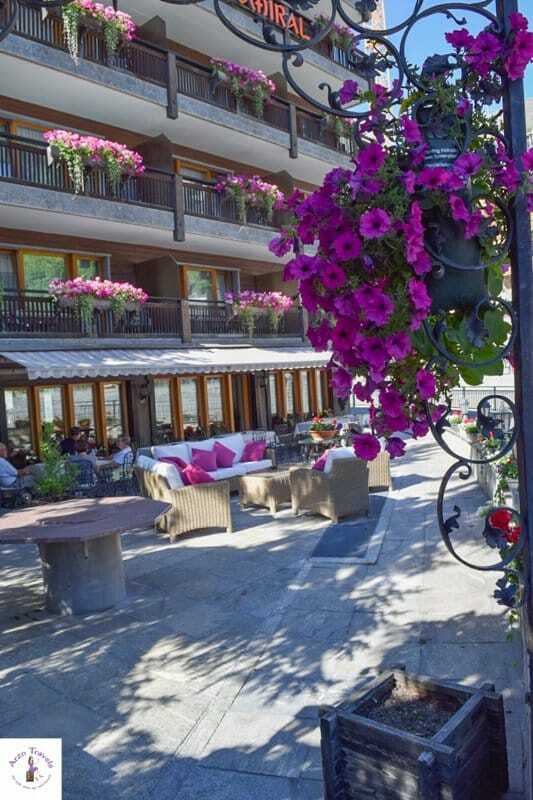 I stayed at this 4* hotel with a view of Lake Geneva, it is located directly on the beautiful promenade and is great for those of you who like to stay central. Click here to find out more about this hotel in Montreux. Solothurn is another very lovely town that is well worth a visit. I was positively surprised how pretty Solothurn actually is. The town centre is very small but you will find some interesting pieces of architecture. One of the most famous is the St. Ursen Cathedral which is located in the town center and there is also the famous clock, Zeitglockenturm. It is a car free town, so it is actually very nice to stroll around and though it seemed that the choices of restaurants lined up along the beautiful Aare (my favorite river in Switzerland) wasn’t great, I was happy to grab an ice cream after lunch and enjoy the sunshine by the river. Listening to the people around me as I basked in the glorious sunshine I could tell that the area was popular with the locals as well as tourists. So, if you find yourself in Zürich or Bern and are looking for a getaway, pay Solothurn a visit. 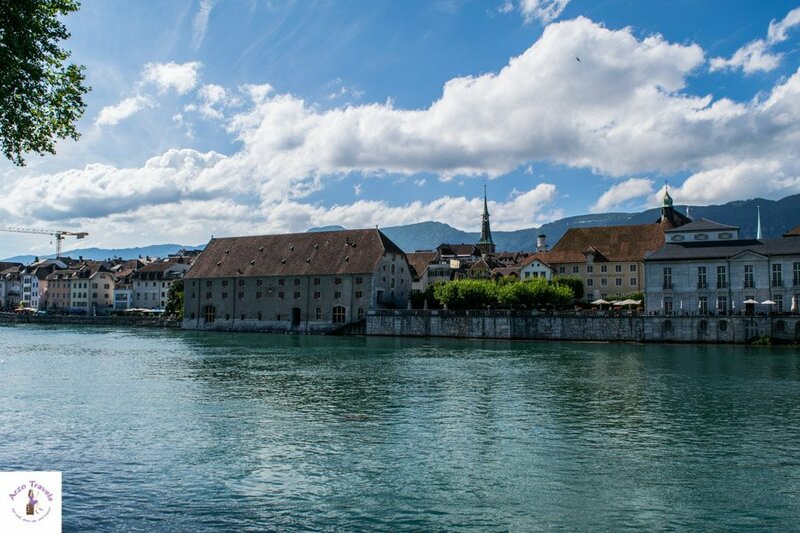 I did not stay in Solothurn overnight, Bern or Zurich are great places to do a day trip from. If you are looking for hotels in Bern, I recommend this centrally located hotel in the old town of Bern. For accommodation in Zurich click here. I spent three days in Grindelwald and was very much looking forward to learning what all the fuss was about. Grindelwald – one of the most popular towns in Switzerland – is indeed very beautiful and it is located in the Jungfrau/Interlaken region with great views of the Swiss Skyline. The town itself is so popular because it is in one of the most visited regions for skiing in and in summer it is a great base for people who like to hike. There are a great many attractions in Grindelwald including the rewarding hike from First to Bachalpsee Lake where you can take in a variety of wildflowers, mountain peaks, glaciers and the lake itself. The town center itself is very small and you can pass through in a very short amount of time, but it is extremely picturesque and especially perfect for those who like to be more active because there are so many mountains and great places close by. 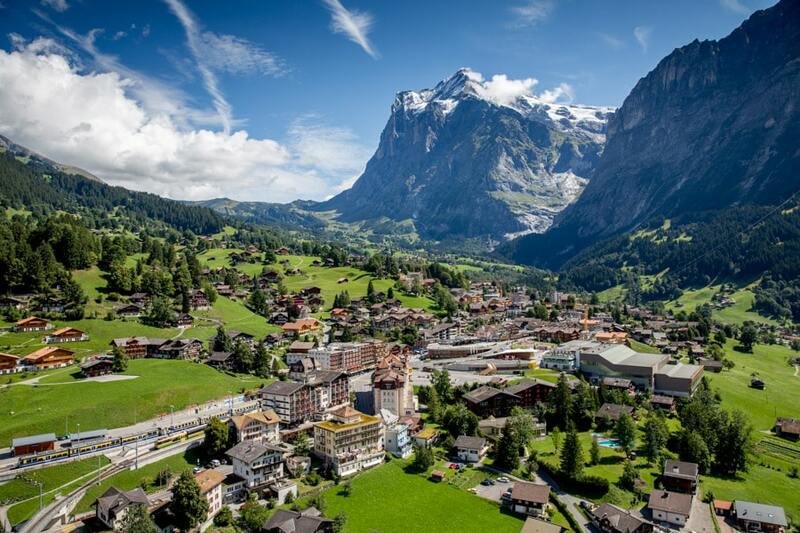 There are some very nice, typical Swiss hotels in Grindelwald. I stayed at the Hotel Caprice Grindelwald and really liked my stay. Click here to find out more about this hotel. Cannot get enough? Here are more answers to your question: Where to visit in Switzerland. Colorful Ascona, located on the northern shore of Lake Maggiore and just 30 minutes away from the Italian border, is brimming with Italian style! Not only this, but it combines a warm climate perfect for palm trees, with fantastic views of the Alps. The Old Town and its lively piazza make Ascona one of my top places to visit in Switzerland. From here you can saunter down the lanes to the Lake Promenade filled with street cafes where you can take time to relax and enjoy the views. If you like the water as much as I do, Ascona offers boat rentals or even stand up paddle board rental so you can explore the lake yourself. Another idea is to book a boat ride to Brissago Islands’ botanical park where you can see 1500 different species of plants. 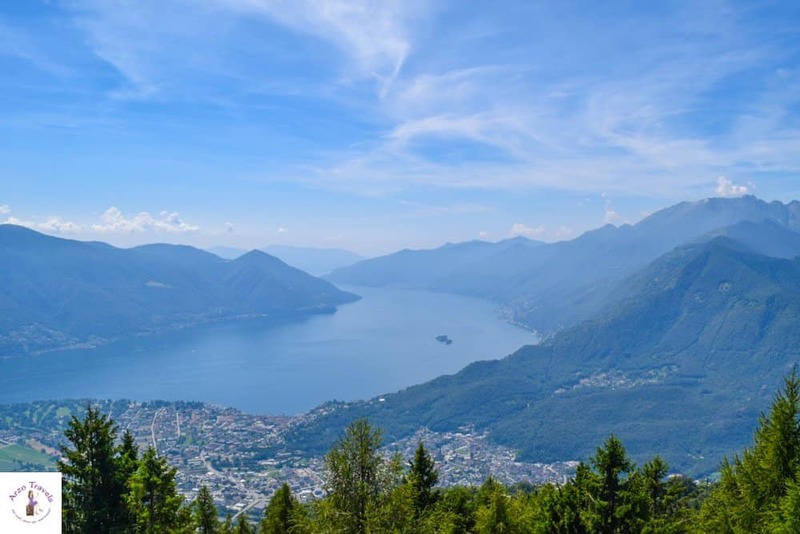 To get even closer to nature, Ascona has great alpine trails for hiking, biking or rock climbing so whether you want sunshine and relaxation or to make a splash and get lost in the wilds you can do it all in Ascona. I stayed at a very perfect hotel in Locarno Orselina when I did a day trip to Ascona. The amazing Villa Orselina is a great base if you want to enjoy a luxury hotel close by. 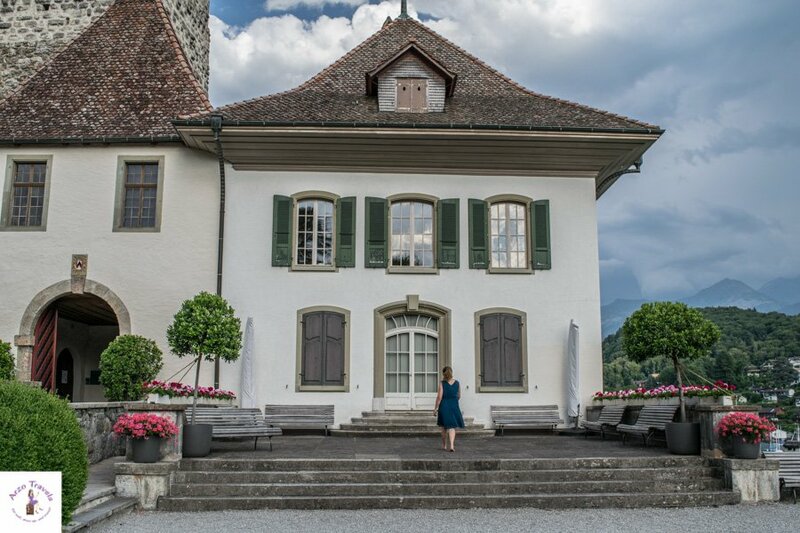 Find out more about the best hotel in Switzerland by clicking here. If you are looking for a place in Ascona or a more budget hotel click on the button below. Mürren is a tiny traditional Swiss village, complete with snow blanketed little wooden chalets, wild flowers and bell-ringing cows, at the foot of Schilthorn peak. Mürren itself is very small, located on a sunny terrace you will find incredible views of the Eiger, Mönch and Jungfrau mountain as well as 360 degree views if you venture to the top of the Schilthorn. The main sights in Mürren include the Piz Gloria revolving restaurant where you can observe, while you dine, views of 200 snow-capped mountain peaks from the Bernese Alps to Mont Blanc in France and Germany’s Black Forest making for a spectacular experience. To get to see this place you’ll need to travel up Schilthorn (some might remember the place for a old James Bond movie). Mürren is a great place to relax and enjoy quiet trails or for the more active it also tends to have good snow high up, even when other regions are not doing so well, so it is always popular with skiers. 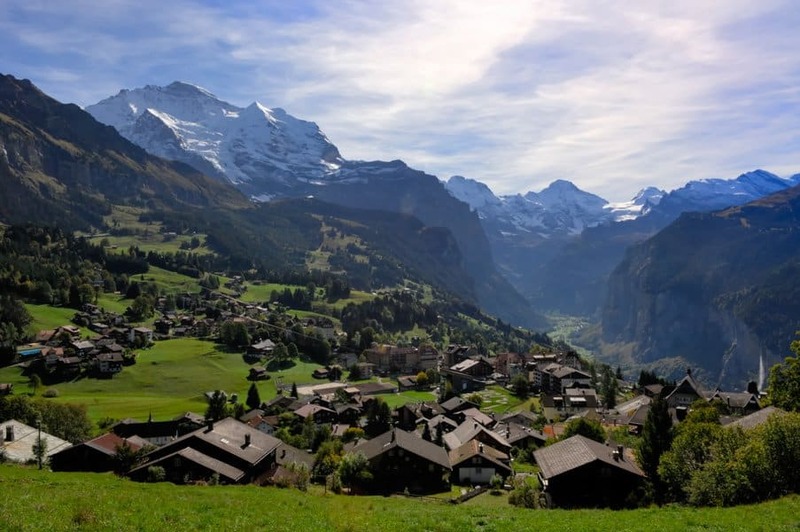 I stayed in Grindelwald when I visited Mürren for half a day, for hotels in Mürren click here. 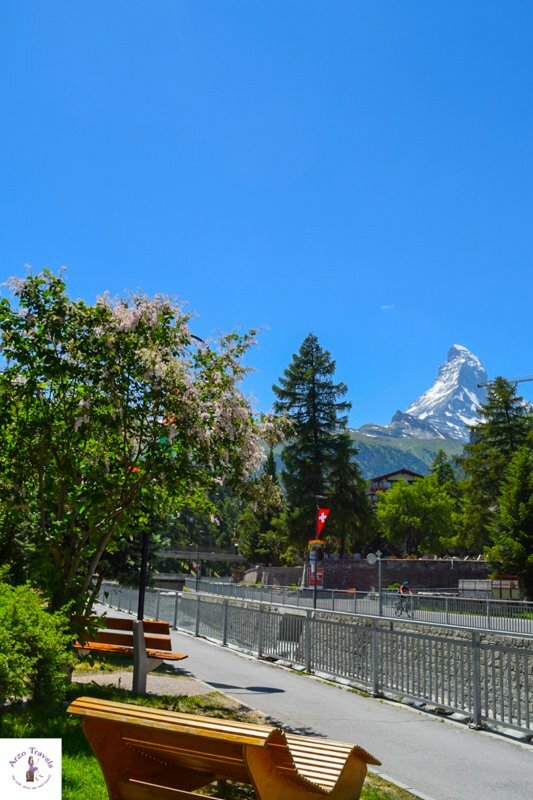 Zermatt is a picturesque village nestled at the foot of the world-famous Matterhorn, a huge pyramidal mountain peak straddling the border between Switzerland and Italy. In summer, brightly colored flowers spill from window boxes and wobbly weather-beaten chalets on cobble stone streets complete the look. The main street runs through the village and is lined with restaurants, bakeries, and shops. Zermatt is one of the best places to go in Switzerland for winter sports enthusiasts and offers a huge number of different excursions. For skiers there are 38 peaks over 4,000 meters and 360 kilometers of pistes and for hikers and cyclists over 400 kilometers of trails leading through and beyond the Matter Valley. However, Matterhorn is also great to visit in summer. Check out the Matterhorn museum where you can see the equipment used in the first tragic ascent of the peak in 1865. The highest cable car station in Europe at 3883 meters high is called Matterhorn Glacier Paradise. Here there are breathtaking views out onto France, Italy, and Switzerland. Be sure to make enough time to explore as the air is pretty thin at this altitude! If you need to stop for a while there is a restaurant and a shop up there. While you’re up there, don’t miss out on the Glacier Palace! Another fun activity is a visit to Gorner Gorge. Created by the waters of the Gornervispe river rushing through the gorge has grown ever deeper. It does not surprise that accommodation in Zermatt is very expensive. 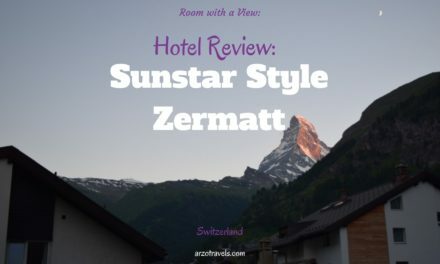 I had a great stay at Sunstar Style Hotel Zermatt with a view of the Matterhorn. Click here to find out more about this hotel. You’ll find Brienz amongst the mountains at the eastern end of the most beautiful lake in Switzerland, Lake Brienz. It is most famous for its wood carving and violin making and continues in these traditions today. Many of the houses here are decorated with carvings making the village its own best advertisement. For the ultimate in romance head to Brungasse, once given the title of most beautiful street in Europe. If you love the relaxing feeling of being near the water anywhere near as much as I do then you will adore Brienz. The lake’s 14km stretch can be explored by boat. If you are thinking of taking a boat trip try and book one that allows you to see Giessbach Falls. These consist of 14 consecutive waterfalls, falling from a height of 500 meters and if you’re willing to walk the steep path right up to them you can even walk behind some of the falls. The lake is also a great starting point for walking in the surrounding area. One really popular route that you can take runs along the southern bank of the lake from Bonigen to Giessbach and through Iseltwald. Another of Switzerland’s popular tourist attractions is the little red steam train that chugs up the mountain through lush meadows and forests that make way for craggy rocks and alpine meadows higher up. It’s a great way to feel close to nature (with the train doing most of the work) and the views at the top do not disappoint, revealing the Bernese Alps and Lake Brienz. My top tip for a place to stay is: Again it is Grand Hotel Giessbach – to find out why I love it click here. 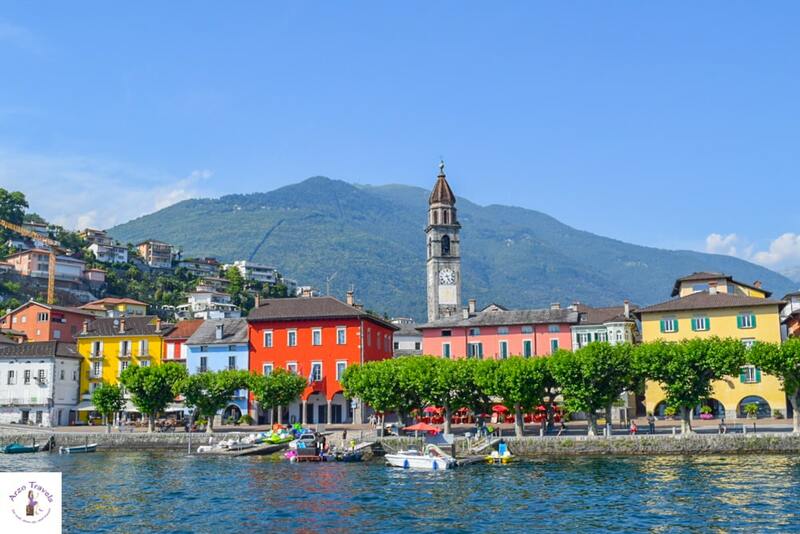 Locarno, a short journey north-east from Ascona, shares the same warm climate and Mediterranean feel. It’s a lively town with great views of the Lake Maggiore and the warm weather blesses the town with palm trees and lemon trees and bounteous displays of blossoming flowers early each year. A special spectacle here is the International Film Festival each year when the Piazza Grande becomes a huge open air cinema. One beauty spot to include on your Locarno itinerary the Sacred Mount Madonna del Sasso in Orselina. The church here lies on an outcrop of rock where you can admire the natural beauty of the area and out over Locarno, Lake Maggiore and the surrounding mountains. While you are in the Orselina you can take a cable car up to Cardada Mountain, also known as ‘the Pearl of Lake Maggiore’- where you can sit and enjoy the spectacular views of the Locarno region. In winter, if you are fortunate, you will be able to witness the sea fog that rolls in the cover the whole of the Lake Maggiore basin. 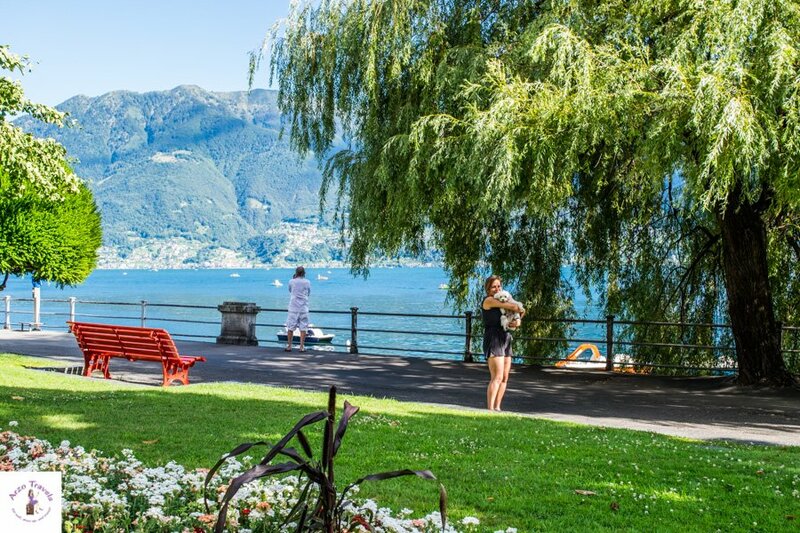 Locarno has boat trips out on the lake in the same manner as Ascona as well as Lido Locarno where you can relax in one of its many thermal baths or pools. Locarno is home to one of the best hotels in Switzerland – Villa Orselina. This gorgeous, somehow simple but definitely amazing, luxury property is my top pick for a stay in Locarno. Click here to find out more about this hotel in Locarno. If you want an adrenaline kick you can do a “James Bond- Golden Eye bungee jump” at Contra Dam, close to Locarno. Picture perfect Spiez sits on a promontory jutting out into Lake Thun, above which the Niederhorn mountain range stretches out to the Bernese Alps creating wonderful views. The area around Spiez is a lush mixture of gardens, vineyards and forests perfect for hiking and biking. There is a great holiday atmosphere in Spiez and the bay is regarded as one of the most beautiful in Europe (according to me). You can’t miss Castle Spiez which looms, with its imposing size and huge tower, over the village. If you take a look inside you will find that is has a stunning interior with lots of history and if you climb the tower you are rewarded with gorgeous views of the lake. There are also great hiking trails here with a 14km Spiez circular hiking trail. If you need a rest after that you can try a relaxing cruise on the lake. The paddlewheel steamship ferries passengers from Thun to Interlaken all year around. Finally, there’s a wine growing museum where you can learn about local viticulture and of course, if you like wine, you have to stop by at a local wine cellar and try some of the produce. Interlaken was my base both time I visited Spiez. The hotels I stayed at and which I can recommend for Interlaken are: Grand Giessbach Hotel and Hotel Interlaken. Spiez is not far away and get easily reached from Interlaken (by train or car). Nyon is a pleasant and peaceful little town on the shores of Lake Geneva and amid the vineyards of La Cote. 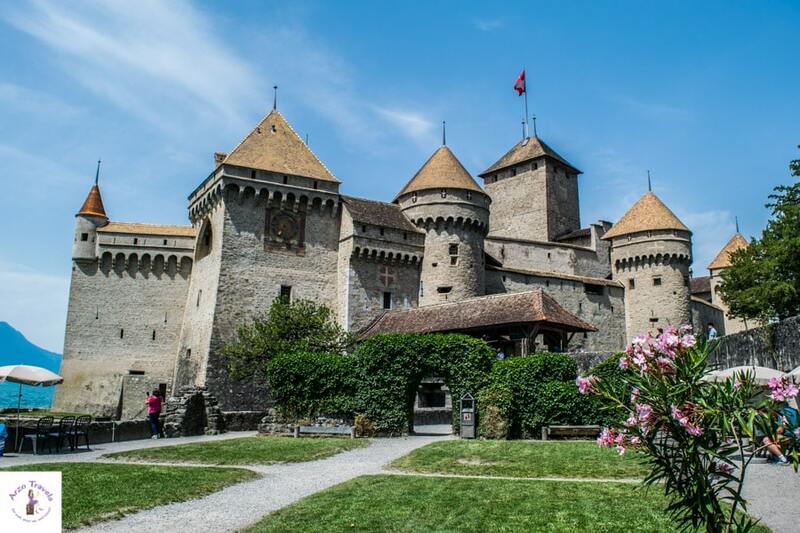 It was built originally around Chateaux de Nyon which now towers over the Old Town. It is also known for its lovely marina and lakeside promenade. It’s also particularly family friendly as an area and the town’s free beaches and many parks and play areas are perfect to help wear out your little ones. 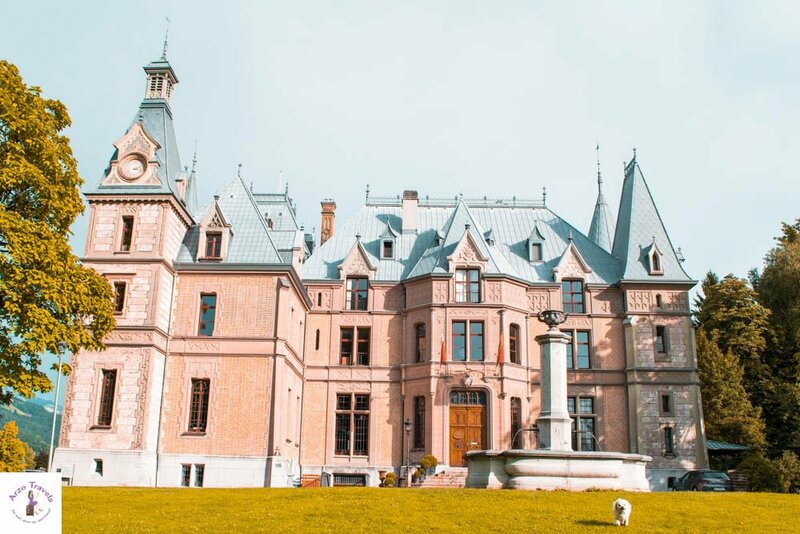 If you pay a visit to the Chateux de Nyon, access to the courtyard and terrace is free and provides spectacular views of Lake Geneva, the French Alps, Mon Blanc, and if you are lucky you will even see the famous Jet d’Eau fountain. To learn more about Lake Geneva or ‘Lac Leman’ you can go and saunter around the Museum of Lake Geneva to learn about the lake’s origins, its flora and fauna and also local history. If you have kids with you they have many opportunities for interactive learning. 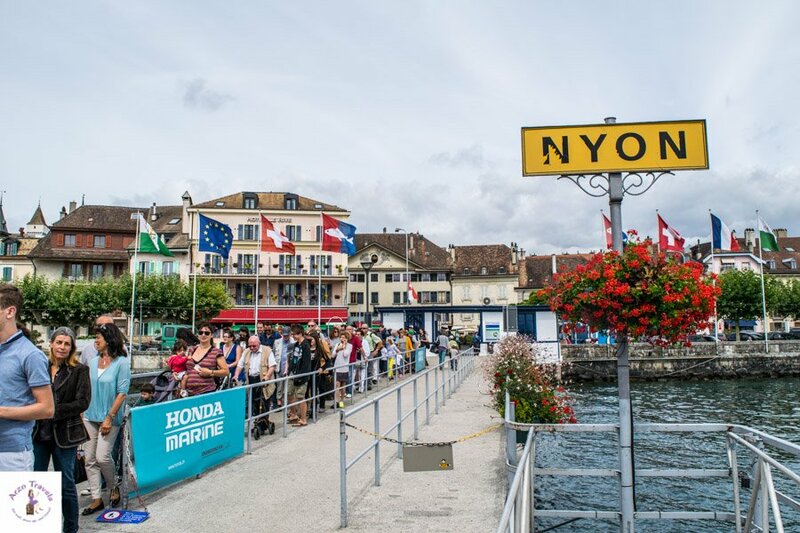 I visited Nyon twice for a couple of hours and one time Montreux was my base (Nyon can easily to be reached by boat or train). In Montreux I recommend a beautiful 4* hotel with a great view of Lake Geneva. Find out more about the Eurotel Hotel in Montreux by clicking here. Another important town for your Switzerland itinerary is Lauterbrunnen which translates as ‘many fountains’. It is situated in a U-shaped valley surrounded by the magnificent Alps and boasts as many as 72 thundering waterfalls amongst alpine meadows and mountain inns and is, in fact, one of the biggest nature conservation areas in Switzerland. 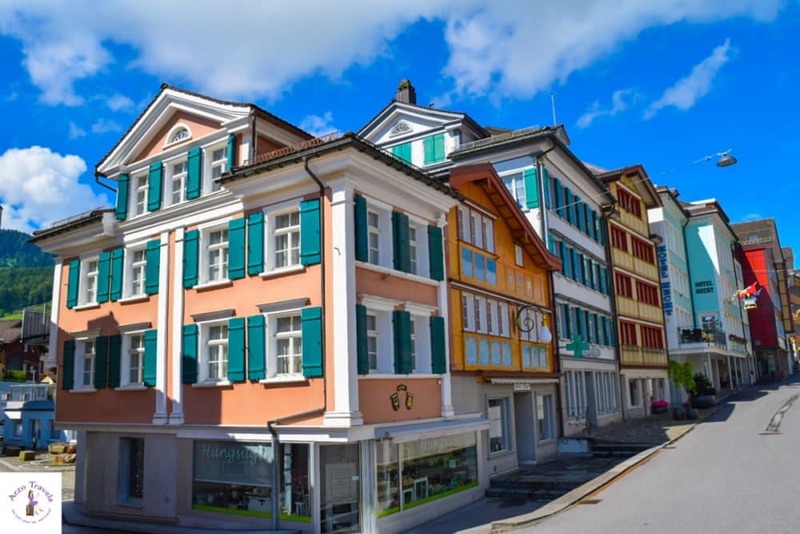 The town itself is filled with beautiful timber facades and lies right alongside the beautiful crystal-clear river of the glacier-fed Lutschine making it one of the most beautiful places in Switzerland. Two major attractions in Lauterbrunnen are Staubbach Falls on the edge of the village where water plunges almost 300 meters from an overhanging cliff face and the Trummelbach Falls – Europe’s largest subterranean caves containing ten thundering waterfalls which have carved the rock over millions of years into strange and wonderful shapes. Lauterbrunnen doesn’t just have waterfalls to offer though. You can also take the Jungfraubahn (a cog railway) to Europe’s highest railway station, the Jungfraujoch, at 3454m or take the cable car ride to the Schilthorn with its views of Eiger, Mönch and Jungfrau. Lauterbrunnen has some basic hotels (no 5* hotels in Lauterbrunnen itself), I visited Lauterbrunnen twice when staying in Grindelwald and can recommend this typical Swiss hotel in Grindelwald – just click here (easy to get from Grindelwald to Lauterbrunen). 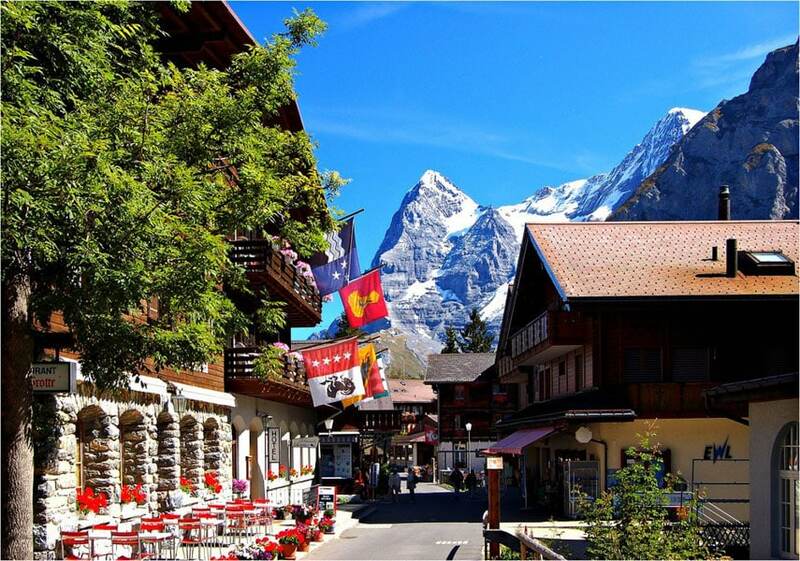 Another car-free, family friendly resort is Wengen, which is known for its pure mountain air and sunny location amongst the alpine pastures and forests at the foot of the Jungfrau. Views from here include the spectacular Lauterbrunnen Valley and the Jungfrau mountain range’s snow-capped peaks. Wengen, like Lauterbrunnen, is a good setting off point to take the Jungfraubahn railway journey up onto the Jungfraujoch summit, one of the best of Switzerland’s tourist spots. The journey takes you through a 7km tunnel in the rock with viewing windows so you can peek into the magical glacier world beyond. Once at the summit ‘the top of Europe’ you can explore the ice carvings in the ice palace or take a husky driven sled ride, and that’s before mentioning the stunning panoramic views of the snow-covered alps. For those who want even more adventure, there are opportunities here for river rafting, canyoning and even paragliding! Wengen has some nice hotels to stay at. If you book a hotel I recommend staying at a hotel with a view of the Swiss Skyline (Mönch, Eiger, Jungfrau). 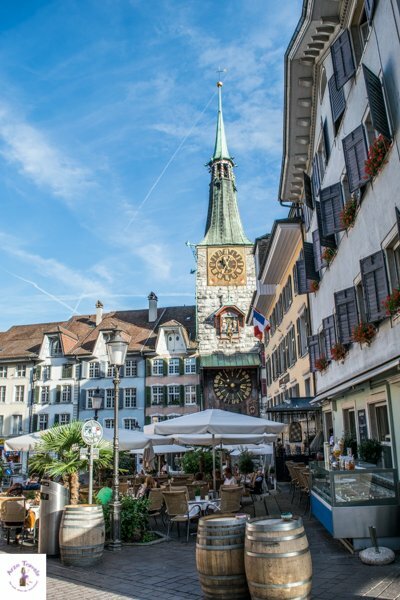 I hope you have enjoyed my post on the best places to see in Switzerland – do not forget to check out my post with recommendations “25 best things to do in Switzerland” and if you want to find all my Switzerland posts click here. Disclaimer: This post contains affiliate links which means I might earn s commission when you buy a product/service via my link (at no extra cost to you). More about it here.